The White House Immigration executive action will affect approximately five million persons, is your I-9 and E-Verify staff ready for the coming changes? Immigration Law in the Workplace is the answer! Immigration Law in the Workplace is the one indispensable resource that keeps its readers current on the latest changes in the Immigration Law. Over 8 million employers have reporting requirements to the IRS, Social Security Administration and the Department of Homeland Security for their U.S. and foreign workers. Thousands of government contractors and subcontractors need to comply with federal regulations that require them to use the E-Verify electronic system for new hires and their existing employees. Immigration Law in the Workplace is the only immigration handbook written specifically for American companies, their managers, immigration compliance staff and legal professionals. It covers everything you deal with - and will deal with - on a daily basis in regard to foreign workers. It walks you through all the current steps and helps you set up a framework so you’re not exposing your company to federal investigation, federal prosecution, white collar criminal liability and penalties. 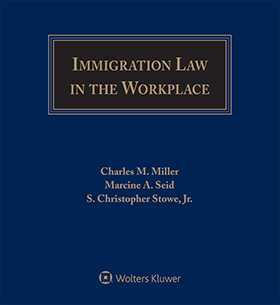 Immigration Law in the Workplace is the first and last book your company will turn to for immigration employment questions. Clear, concise guidance from leading immigration employment and tax experts provides you with direct understanding of compliance rules. The latest information from the Federal government is fully explained - accompanied by charts and forms that assist decision making and compliance. 9. EMPLOYMENT IN THE U.S.